THIS IS THE INTERNATIONAL EDWARD GREEN WEBSITE AND CURRENTLY EXCLUDES THE UNITED STATES. Orders placed before 2pm will be dispatched the same day with delivery guaranteed for the next working day to all UK (excludes Northern Ireland, which takes 2 working days for delivery), and EU delivery destinations. Other global destinations take 3-5 working days for delivery. If for any reason we anticipate a delay beyond our quoted delivery times we will get in touch to let you know. For all online orders you will receive an email confirming when your order has been despatched. This email will also contain a tracking number to allow you to track the progress of your delivery with the carrier we are using to deliver your order directly. Deliveries are made between 8:30am and 6pm, and will require a signature to ensure the safe and secure delivery of your order. It’s because of this that we are unable to deliver goods to PO boxes. Please note that after an order has been dispatched we are unable to amend delivery details. If you are worried that your goods have been lost at some point on their journey to you, please contact our Customer Services team within 28 days of placing your order. In the unlikely event your goods arrive in a damaged condition, or there is a discrepancy in the contents of an order you have received, please contact our Customer Services team within 48 hours of receipt of the delivery. You will also need to ensure that all original packaging is kept. If you order from our site for delivery outside the European Union, they may be subject to import duties and taxes, which are levied when the delivery reaches its destination. You will be responsible for payment of any such import duties and taxes. For further information on duty and tax we suggest you contact your local customs office. To present a digital or printed copy of your order confirmation email. The credit or debit card used to complete the transaction. If someone is collecting the order on your behalf, your signed written permission and copy of the card and confirmation email. 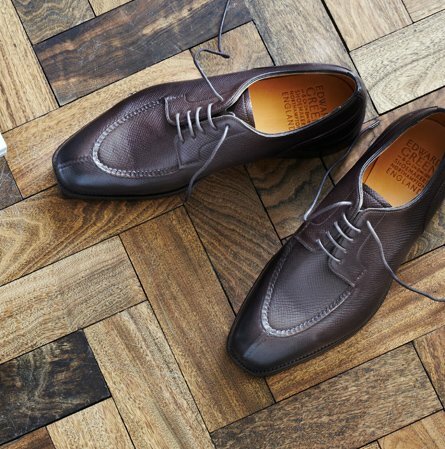 As well as offering you a smoother checkout process and convenient way to handle your personal information, creating an account allows you to see your full Edward Green shoe collection, whether it be purchased online or in store. By making a purchase on EdwardGreen.com you can create an account and link it up to other purchases made using the same email address. If you have forgotten your password you can reset it by entering your email address on the forgotten password page and we will send you an email that contains a link to reset your password and log in to your account.